We at StrongGo Industries would like to take the time to thank our loyal longstanding clients including Architectural and Designer firms, Project Engineering companies as well the contractors who buy our products for both public and private projects. We are committed to the quality of our products and grateful for their resounding acceptance throughout the design world and the construction industry. TekWay ADA Domes were brought to the market on an initial request from the Arizona Department of Transportation, (ADOT) which had been searching for an ADA Dome paver designed to resist the harsh climate conditions with their state. In 2003, the objective for a period of durability and lasting functionality of ADA Domes had been set for a minimum of ten years. The need for detectable warning systems to warn visually impaired pedestrians of hazards on a path of travel has been recognized since 1991 when the ADA enacted the requirements for truncated domes. In 2001, the Department of Justice established the requirements for detectable warning surfaces for curb ramps, hazardous vehicular ways, and mass transit platforms within the public ‘right-of-way’. The implementation and reliable functioning of ADA Domes at legally defined locations are considered a civil right. Since its market introduction in 2004, TekWay’s commitment has been to deliver quality customer service by manufacturing products that function as designed. 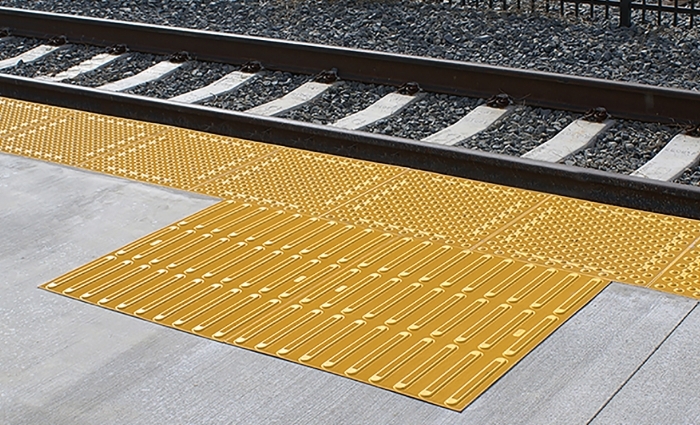 These detectable warning products are known to be a reliable device of orientation for those with low vision and a proven solution for the owners. Aesthetically appealing, TekWay ADA Dome Tiles enhance the appearance of all locations within the public “right-of-way” where curb ramps, street crossings, and mass transit platform are designed into a project. We are a company devoted to the ongoing research, development and manufacturing of products that have been formulated to possess outstanding physical, chemical and mechanical properties. StrongGo incorporates its advanced nanotechnology into every high quality product manufactured. Most certainly, these high quality standards extend into every custom line of work to create fully customer-satisfying solutions for applications in construction, mining, and other industries. StrongGo® Industries is the owner, designer, developer, and dedicated manufacturer of TekWay® High Performance ADA Domes/Detectable Warning systems. All materials used for the manufacturing of our nano-engineered and fiber-reinforced concrete composite ADA dome systems are of 100% US origin, and every delivered TekWay dome-tile is made exclusively in the USA. As with all good things, the journey to identifying the best product takes an informed buyer, knowledge and diligence. Your journey has begun. Thank you for your consideration and interest in TekWay High Performance ADA Systems.